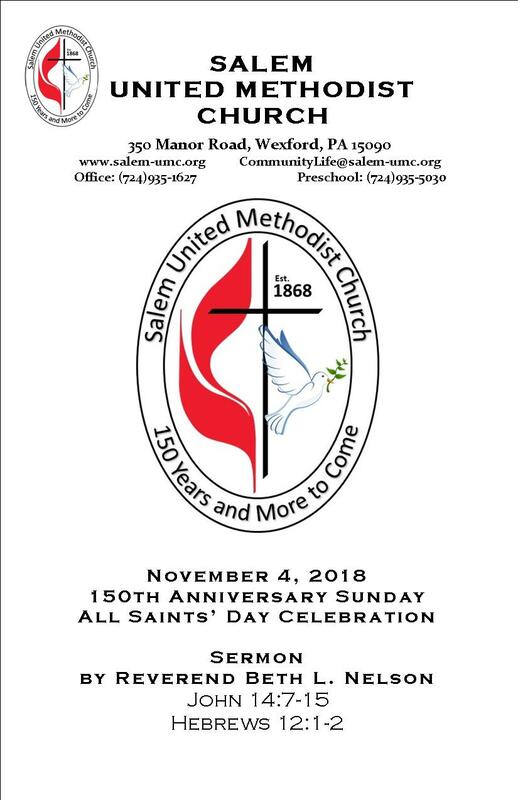 And on this Sunday when we are celebrating All Saints Day and 150 years as Salem United Methodist Church, it, too, is a day of triumphant joy. We don’t talk about saints much on the Protestant side of Christianity. We leave that to our Catholic and Orthodox brothers and sisters. But if I am honest, I must admit to knowing several protestants who really knew how to celebrate St. Patrick’s Day! We are too afraid of making idols out of them, and so we acknowledge their place in church history, but we don’t talk about them as much as we maybe should. But I have friends who grew up in churches where the lives of the saints were always being discussed. It was a part of the fabric of their lives. They knew the most important saints’ days, they knew the patron saints for their parish or their town or their heritage. And some of them even say that when they were children their first ambition was to become a saint. But there is a beauty about All Saints day. We come to church on this day to remember not just those old saints who supposedly did things like drive snakes out of Ireland or who blessed the animals. But saints who had visions and dreams and gave us Salem Church. When I think back, a hundred and fifty years ago…. I am sure that it was not as smooth as history records. I know how people are… I am most certain that Andrew English said…. Let’s start a fellowship group and grow a church. I am sure he had that vision and God’s spirit moved in his heart. But I am equally sure that there were those who said: “It cannot be done.” “We have never done it that way before.” “We do not have enough money.” “Let’s form a 5 year feasibility study!” But Mr. English and others persevered, and Salem began the journey as an agency of hope in the north hills of Pittsburgh. I doubt if the dinner time conversations revolved around being saints one day? I wonder if they thought their efforts would someday result in a 150th anniversary celebration in 2018? Their vision and faithfulness have changed the world for many people. In a few minutes we will be taking part in communion. One of the things that is most incredible to me about the sacrament is that it binds us not only to God, but to one another, and to the whole communion of saints. When we sit at this table we sit here not just with each other, but with the believers of all times and places who are now saints. They are with us. The saints we have known are here with those who would-be saints. This has been happening at Salem for over 150 years. The ones who sat in these pews, as well as the pews of other buildings, and who left a church here for us, they are here too. And long after we are gone, and everything that we know is gone, that communion of saints will remain and hopefully we too will be a part of it. The book of Hebrews was written to a church that was getting old and was settling into the world and losing its zeal for evangelism and starting to drift through life without focus, without vigilance, and without energy. Their hands were growing weak, their knees were feeble. It was just easier to meander in the crowd of life than to run the marathon. In the first couple of chapters, the writer of Hebrews says that “we must pay much closer attention to what we have heard, lest we drift away from it. . . . How shall we escape if we neglect so great a salvation?” People are growing careless, drifting from here to there, spiritually lazy, and negligent. This was written to a church with faith fatigue whose author wanted them to remember past people of faith to energize them for struggles that lay ahead. Since we are surrounded by so great a cloud of witnesses, then let us lay aside every weight and the sin that clings so closely and run with perseverance the race that is set before us. A cloud of witnesses surrounds us and Paul reminds the Church of the Hebrews and contemporary Christians to look to Jesus, our example and, through God’s grace, our strength, as we press ahead in the challenging race of life. We live our lives in different ways. Some of us gently stroll through life. Others are looking at a 5k walk. Yet others choose a half marathon and yet others take on a full marathon every day, living life to the fullest. For 150 years, people of Salem church have gathered to hear the word of God proclaimed, they have bowed their heads in prayer, they have lifted their voices in song and they have lived their witness in the world. They have listened to God’s spirit challenge them and they have boldly listened. Where God leads this church in the next 150 years is a story yet to be written. But I am confident that with the saints gathered here today, we will have a faith filled, bold future, following the author of our faith.